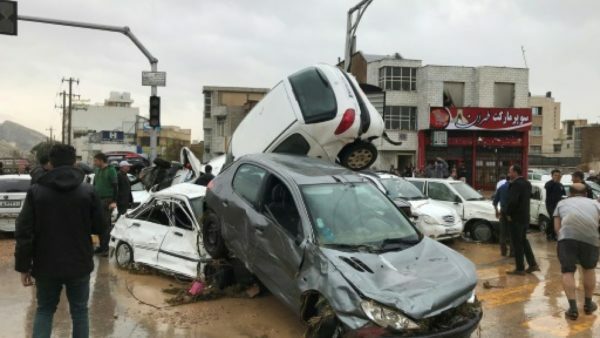 Major floods across much of Iran have left 18 people dead and more than 70 injured, blocking roads and triggering landslides with warnings of more heavy rain to come, emergency services said Monday. With 25 of Iran’s 31 provinces experiencing floods or facing imminent threat, the country’s National Crisis Management Committee was activated at cabinet level. “I have ordered all governor-generals, all provincial managers and officials nationwide to stay at their posts throughout the next 72 hours which is the peak of the flood threat,” First Vice President Eshagh Jahangiri said on state television after the committee’s first meeting. Since the flooding, Iran’s President Hassan Rouhani, a moderate, has been absent from public view, with his deputies and ministers taking his place in visiting disaster-struck areas. Iran’s meteorological service has warned of more heavy showers until Wednesday, forecasting as much as 15 centimetres (almost six inches) of rainfall in some western provinces in the next 24 hours. The situation is “critical” in the provinces of Khuzestan, Lorestan and Kohgiluyeh-Va-Boyerahmad, said Deputy Interior Minister Mehdi Jamalinejad, quoted by the ISNA news agency. The latest floods follow major flooding on March 19 in the northeast’s Golestan and Mazandaran provinces, for which no official casualty toll has been issued. Tehran’s Mehrabad Airport announced delays or cancellations of flights to the provinces. “These unprecedented floods in our country are because of climate change worldwide,” he said, quoted by Tasnim news agency.